The Pocono Mountains area is an outdoor enthusiast’s dream vacation! There are miles of wonderful hiking trails scattered across the region. 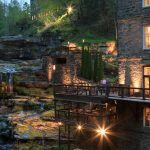 Whether you’re hoping to go on one of the popular Poconos waterfall hikes or you’re looking for the best place to hike with your dog, you’ll find options that are an hour or less from Ledges Hotel. So lace up your hiking boots and grab your camera! It’s time to experience the best of hiking in the Pocono Mountains. If you’re looking for other great ways to experience the gorgeous wildlife in the Delaware Highlands region, download our free Vacation Guide! From the best stables that give horseback riding tours to world-class golf courses, we list it all. If you just want a simple walk with an outstanding view, head to the Wallenpaupack Lake Trail. This is a favorite among Hawley residents, especially those who want to take a quiet stroll and enjoy the surroundings. During the 2-mile hike, you’ll get a splendid view of the magnificent lake, as well as get to explore some of the Wallenpaupack Creek and cross the Wallenpaupack dam. The starting point for the Wallenpaupack Lake Trail is just a 10-minute drive from Ledges Hotel, near our sister property, Silver Birches! Bushkill Falls is a privately owned attraction that features a little bit of everything for everyone! From a miniature golf course to a maze, you’ll find plenty to keep you entertained. The main highlight of the park, however, is the selection of hiking trails. 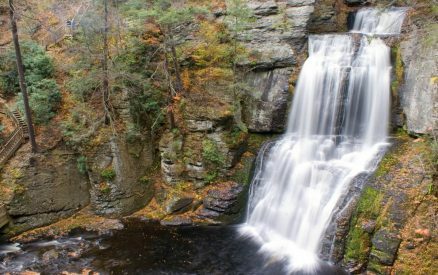 There’s a good reason why this is one of the most popular places to see Poconos waterfalls! There are four paths in total, each varying in length and difficulty. No matter which route you choose, you’ll get a clear view of at least one of the eight waterfalls located in the park. The green trail the easiest and shortest of the options. In total, it takes about 15 minutes to complete. There is no climbing involved, though there are steps. From this path, you’ll be able to see the Main Falls. The yellow trail is slightly harder and longer. In total, it takes about 45 minutes and lets you view the Main Falls, Lower Gorge Falls, Lauren Glen, and Upper Canyon. It also leads you past the wildlife exhibit. The blue trail leads you to Pennell Falls and takes a little over an hour to complete. Finally, the red trail is the most difficult to complete. It will lead you through the entire park and spans almost 2 miles. It includes all eight of the falls and typically takes over two hours to hike. Bushkill Falls is about a 40-minute drive from Ledges Hotel. It is open every day of the week, from 9:00 a.m. to 7:00 p.m. The name says it all! Promised Land State Park is an idyllic spot near Hawley, PA. With over 50 miles of hiking opportunities within the park and the surrounding forestland, you’ll find plenty to explore and enjoy during your visit. 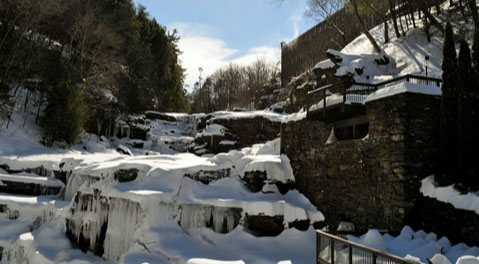 This park includes many of the gorgeous natural features for which Pennsylvania is famous, like glacial lakes and small waterfalls. From mid-May to mid-June, you’ll get to see a spectacular array of flowers in bloom. During October, leaf peepers come from around the region to see the changing colors! Promised Land State Park is one of our favorite places to hike with dogs, so be sure to visit if you’re traveling with your four-legged friend. As a matter of fact, you should also be sure to book our Max’s Wagaway Pet Package at Ledges Hotel! Your lucky pup will get daily treats, a brand-new chew toy, food and water bowls, and a supply of waste bags. You’ll also get our picks for the best hiking paths to walk with your dog! One of the most popular recreational paths in the park is the Bruce Lake Natural Area Trail. This loop runs about 14 miles long and winds through the Delaware State Forest, the Bruce Lake Natural Area, and Promised Land State Park. Another popular route in the park is the Little Falls Trail. This is a much easier path than the Bruce Lake Trail, and winds past Wallenpaupack Creek and the small waterfall for which the path is named. Bring your camera to capture the wonderful sights! The final most popular trail in the park is the loop around Conversation Island. Grab a free guidebook from the park office to take a self-guided hike. Promised Land State Park is just a 20-minute drive from Ledges Hotel. It is open every day of the week from 8:00 a.m. to 8:00 p.m. 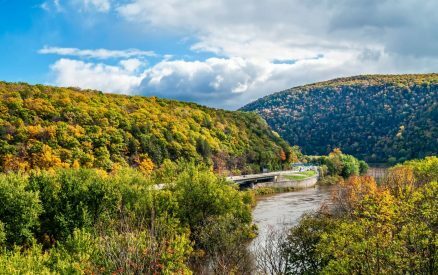 The Delaware Water Gap Recreation Area is composed of 70,000 acres of protected land that winds along the border of Pennsylvania and New Jersey. It is home to part of the Appalachian Trail that’s in the Poconos, as well as miles of other gorgeous hiking opportunities. The area is broken up into three sections: northern, middle, and southern. While the northern part is closest to Ledges Hotel, about 35 minutes away, the southern paths are worth the drive if you’re in the mood for a quick day trip. Most of the park is open 24 hours a day. The Milford Knob Trail is a beautiful forested route that is near the town of Milford. The total loop is a little over 3 miles long and is said to be moderate to difficult. This is trek is best experienced in the spring when the wildflowers start to bloom. The Cliff Trail is a little less challenging than the previous one. It’s also located near Milford, PA, and is known for its scenic views. Dogs are welcome to hike with you, though they must be on a leash. The Scenic Gorge Trail is an excellent option for visitors interested in learning about the natural features of the region. It’s located near the Pocono Environmental Education Center and should be part of your itinerary if you plan on visiting that great attraction. During the hike, you’ll be able to experience first-hand the differences between a hardwood forest ecosystem and a dark, cool hemlock forest ecosystem. You’ll also be able to see a small spring and waterfall along this easy 2-mile loop. If you want to see a stunning waterfall, head to the Buttermilk Falls Trail in the Delaware Water Gap. It’s considered moderately-difficult, with a steep climb, but it’s worth the journey to see one of the tallest waterfalls in New Jersey. In total, it is about a 3-mile walk, there and back. Dunnfield Creek Trail is a 7-mile walk in total and follows the creek for which it is named. Dunnfield Creek is vital to the native brook trout population. It winds through ravines and cascades. There are stream crossings during this path, so be sure to wear shoes that are waterproof and sturdy. If you’re looking for an easy path to walk, find the Slateford Loop! It’s 3 miles in total and is a great spot for cross-country skiing in the snowy season. You’ll get to see an old-fashioned slate quarry and farm during your hike, making this a fantastic option for history buffs! Named for Tobyhanna Lake, the park features three main hiking trails that range from easy to difficult. The Lakeside Trail is the easiest. This loop is over 5 miles long and circles Tobyhanna Lake. Most of the path features a hardened base, making it good for easy hiking and bicycling in the summertime. During the winter, this is a popular spot for cross-country skiing and snowmobiling. The Range Trail is a little more difficult and is almost 7 miles in total. Unlike the Lakeside Trail, the Range Trail should not be attempted without good footwear. You’re going to cross across some wet areas, so you should be wearing good, watertight boots. If you’re up for a challenging hike, traverse the Frank Gantz Trail. There are plenty places where hikers have to “rock hop” along this path. The route itself, however, is well-maintained. Just don’t forget your hiking boots! Tobyhanna State Park is about a 40-minute drive from Ledges Hotel. It is open every day of the year, from sunrise to sunset. After your day of hiking in the Pocono Mountains, return to your comfortable accommodations at Ledges Hotel. There’s no better way to treat yourself after a day of hiking than with a meal in our onsite restaurant, Glass – wine. bar. kitchen. This all-American restaurant specializes in small plates that are meant to share, making it the perfect date night spot. 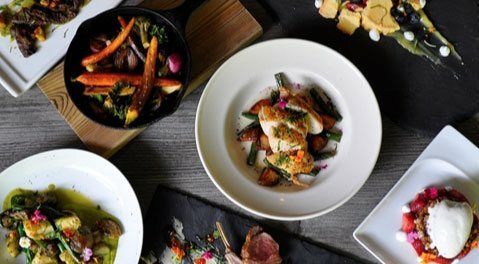 The menu is based on the seasonality of ingredients, but you can trust that you’ll enjoy delicious comfort foods with an upscale, modern twist. Don’t forget about Chestnut Tavern at The Settlers Inn. With an awesome menu and fantastic weekly specials, this spot at our sister property is a must for any foodie visiting the area! 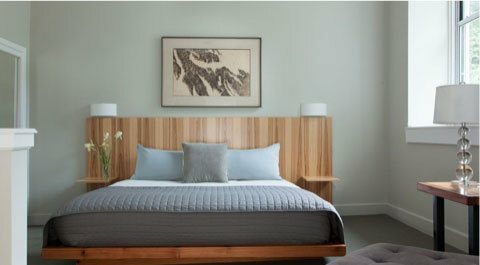 Check our availability and book today! We look forward to having you at Ledges Hotel.